This month: Mozfest, a Digital Rights Cities Coalition, Trustable Technology Mark updates, ThingsCon Rotterdam. Mozfest came and went, and was lovely as always. It was the 9th Mozfest, 8 or so of which I participated in — all the way back to the proto (or prototyping?) Mozfest event called Drumbeat in Barcelona in, what, 2010? But no time for nostalgia, it was bustling as always. The two things that were different for me that one, I participated as a Mozilla Fellow, which means a different quality of engagement and two, M and I brought the little one, so we had a toddler in tow. Which I’m delighted to say worked a charm! At Mozfest, the smart and ever lovely Meghan McDermott (see her Mozilla Fellows profile here) hosted a small invite-only workshop to formalize a Digital Rights Cities Coalition — a coalition of cities and civil society to protect, foster, promote digital rights in cities. I was both delighted and honored to be part of this space, and we’ll continue working together on related issues. The hope is that my work with ThingsCon and the Trustable Technology Mark can inform and contribute value to that conversation. The Trustable Technology Mark is hurtling towards the official launch at a good clip. After last month’s workshop weekend at Casa Jasmina, I just hosted a Trustmark session at Mozfest. It was a good opportunity to have new folks take a look at the concept with fresh eyes. I’m happy to report that I walked away with some new contacts and leads, some solid feedback, and an overall sense that at least for the obvious points of potential criticism that present themselves at first glance there are solid answers now as to why this way and not that, etc etc. Courtesy Dietrich, a photo of me just before kicking off the session wearing a neighboring privacy booth’s stick-on mustache. Also, more policy and academic partners signing on, which is a great sign, and more leads to companies coming in who want to apply for the Trustmark. Next steps for the coming weeks: Finalize and freeze the assessment form, launch a website, line up more academic and commercial partners, reach out to other initiatives in the space, finalize trademarks (all ongoing), reach out to press, plan launch (starting to prep these two). Our annual ThingsCon conference is coming up: Join us in Rotterdam Dec 6-7! Alexandra Deschamps-Sonsino, Cennydd Bowles, Eric Bezzem, Laura James, Lorenzo Romanoli, Nathalie Kane, Peter Bihr, Afzal Mangal, Albrecht Kurze, Andrea Krajewski, Anthony Liekens, Chris Adams, Danielle Roberts, Dries De Roeck, Elisa Giaccardi, Ellis Bartholomeus, Gaspard Bos, Gerd Kortuem, Holly Robbins, Isabel Ordonez, Kars Alfrink, Klaas Kuitenbrouwer, Janjoost Jullens, Ko Nakatsu, Leonardo Amico, Maaike Harbers, Maria Luce Lupetti, Martijn de Waal, Martina Huynh, Max Krüger, Nazli Cila, Pieter Diepenmaat, Ron Evans, Sami Niemelä, Simon Höher, Sjef van Gaalen. Now, 5 years into ThingsCon, the need for responsible technology has entered the mainstream debate. We need ethical technology, but how? With the lines between IoT, AI, machine learning and algorithmic decision-making increasingly blurring it’s time to offer better approaches to the challenges of the 21st century: Don’t complain, suggest what’s better! In this spirit, going forward we will focus on exploring how connected devices can be made better, more responsible and more respectful of fundamental human rights. At ThingsCon, we gather the finest practitioners; thinkers & tinkerers, thought leaders & researchers, designers & developers to discuss and show how we can make IoT work for everyone rather than a few, and build trustable and responsible connected technology. In the UK magazine NET I wrote an op-ed about Restoring Trust in Emerging Tech. It’s in the November 2018 issue, out now – alas, I believe, print only. Reminder: Our annual ThingsCon report The State of Responsible IoT is out. Trips to Brussels, Rotterdam, NYC to discuss a European digital agenda, launch a Trustmark, co-host ThingsCon, translate Trustmark principles for the smart city context, prep a US-based ThingsCon conference. Lots of ThingsCon & Trustable Tech goodness this month. 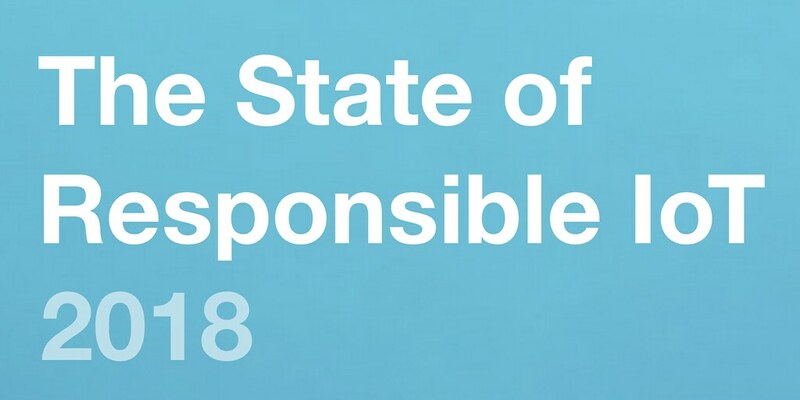 Our (now-)annual ThingsCon report The State of Responsible IoT is out. It’s an annual collection of essays by experts from the ThingsCon community. With the Riot Report 2018 we want to investigate the current state of responsible IoT. In this report we explore observations, questions, concerns and hopes from practitioners and researchers alike. The authors share the challenges and opportunities they perceive right now for the development of an IoT that serves us all, based on their experiences in the field. The report presents a variety of differing opinions and experiences across the technological, regional, social, philosophical domains the IoT touches upon. Our contributors are a veritable all-star lineup from around the globe including Christian Villum, David Li, Dries de Roeck, Prof. Dr. Eduardo Magrani, Prof. Dr. Elisa Giaccardi, Ester Fritsch, Prof. Dr. Gaia Scagnetti, Holly Robbins, Iohanna Nicenboim, Prof. Dr. Irina Shklovski, Iskander Smit, Dr. James Pierce, Dr. Laura James, Luca van der Heide, Maya Indira Ganesh, Peter Bihr, Dr. Rachel Douglas-Jones, Dr. Ronaldo Lemos, Prof. Dr. Seyram Avle, Prof. Dr. Silvia Lindtner, and Simon Höher. With lots of priceless input from Jason Schultz, the kind help from our partner test companies, and based on feedback from across the ThingsCon network, we’ve managed to hugely streamline the application process for ThingsCon’s Trustable Tech mark—while also making it a lot more robust by putting human experts in the loop. Brand Eins interviewed me about IoT and how it challenges our notion of ownership and trust. Details in my blog post here. The text is now available for free (no more paywall). Trips to Torino for a ThingsCon & Trustmark workshop & to London for Mozfest. What’s more, I’m not alone in this endeavor—far from it! More and more folks from the ThingsCon network have been giving their input, which is priceless. Also, Pete Thomas (University of Dundee) has been taking the design lead and been a great sparring partner on strategy questions, and Jason Schultz (NYU Law) has been thinking about legal and policy implications. A big thank you to Pete & Jason! I’m super excited this is moving along at such a clip. Brand Eins interviewed me about IoT and how it challenges our notion of ownership and trust. Details in my blog post here. My somewhat eclectic newsletter Connection Problem has completed Season 3 with just over 30 installments. I’m taking a writing break of a few weeks, and then I’ll kick off Season 4 soon. Sign up now if you want to follow along! With ThingsCon, we co-signed not one but two declarations and open letters: The Toronto Declaration about AI and human rights (initiated by AccessNow) and the Open Letter to G20 Leaders. I got to join a whole bunch of things those last few weeks. I thoroughly enjoyed both a workshop on IoT security and market surveillance by Stiftung Neue Verantwortung, where we discussed all things certification, incentives and assessment frameworks; and the always fascinating Museum of the Future workshop in Berlin. I’d been to one in Amsterdam before, and even though I’m spoiled by greatly curated events, the group that Noah & team convene in this context is humbling and fascinating and the only thing I wished is that I could have been there full time, which this time alas wasn’t possible. In between the two I got to go to New York City for meetings and a quick swing-by at Data & Society, as well as Toronto for the Mozilla Foundation’s all-hands where I was kindly invited to participate as a fellow. Speaking of committed & warm & driven groups! After that, some family time in the Pacific Northwest, and a short vacation, which included a little road trip through the Cascades. What a stunning & wonderful region! On one hand I’m gearing up the planning for fall. If you’d like to work with me in the upcoming months, I have very limited availability but am always happy to have a chat. On the other I’m pretty much heads-down to get the trustmark to the next level. This includes the nitty gritty work of both improving the trustmark assessment tool, and of lining up launch partners. It also means planning a little road show to expose this idea to more eyes and ears, including ThingsCon Salon Cologne, Mozfest, ThingsCon Amsterdam, and a few other events in between. We’re also in the middle of copy-editing the upcoming 2018 issue of the ThingsCon report “The State of Responsible IoT” (#RIoT). More on that soon. So back to the text mines!